The final season of the hit CW series is going red, white, and Blu this fall. In an early announcement to retailers, Warner Brothers is prepping 'Smallville: The Complete Tenth Season' starring Tom Welling hitting Blu-ray on November 8. The series that redefines the origins of the world’s greatest hero reaches its powerful conclusion with more revelations, more fascinating characters from DC Comics lore and a mind-blowing, spirit-lifting finale that is everything fans could want. In this 22-Episode Season 10, super heroes emerge from the shadows, only to be driven underground by a public that labels them vigilantes. At the same time, otherworld forces of darkness gather, presenting Clark Kent with the greatest challenge of his young life. The world he calls home and the people he loves – including Lois Lane, who now shares his secret and his life – need a champion. They shall have one. Don’t miss all the hopes, heartaches and heroics of a final season to remember. They will lift you up, up and away. 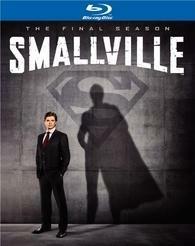 The 4-disc Blu-ray set will feature 1080p video, a DTS-HD Master Audio 5.1 soundtrack, and supplements include: Commentaries on 2 episodes, unaired scenes, Smallville: Coming Home featurette, My Fathers - My Son featurette, and "How Do We Do" music video. You can find the latest specs for 'Smallville: The Complete Tenth Season' linked from our Blu-ray Release Schedule, where it's indexed under November 8.